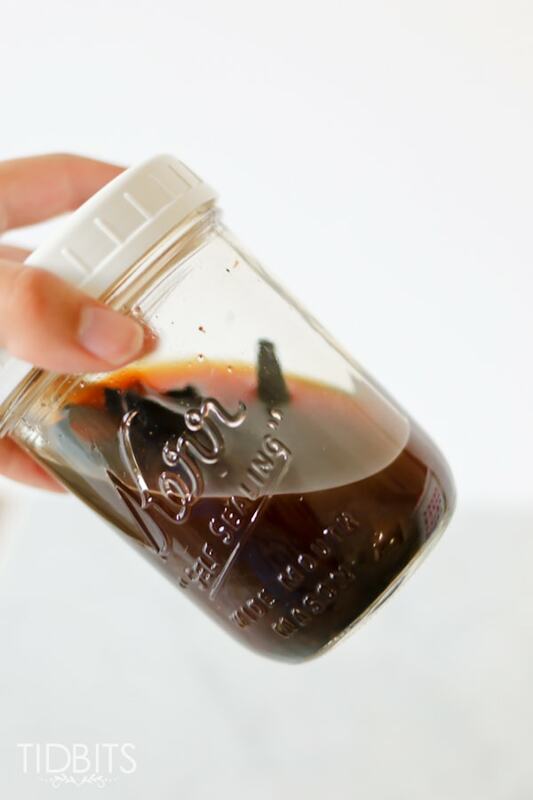 Pressure Cooker Vanilla Extract is made in less than an hour! It’s fragrant, powerful, and more affordable than store bought. If you haven’t jumped on the pressure cooker train yet, I insist you do now! 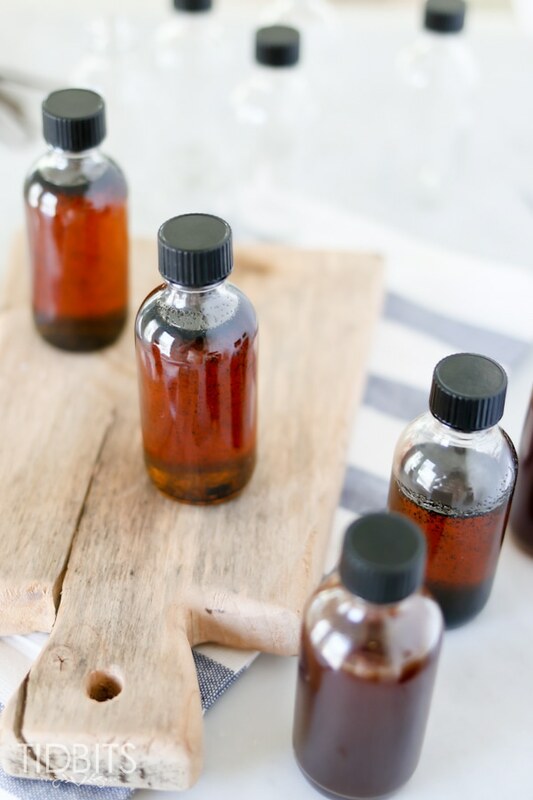 Check out this post here for an updated Vanilla Extract recipe and FAQ. 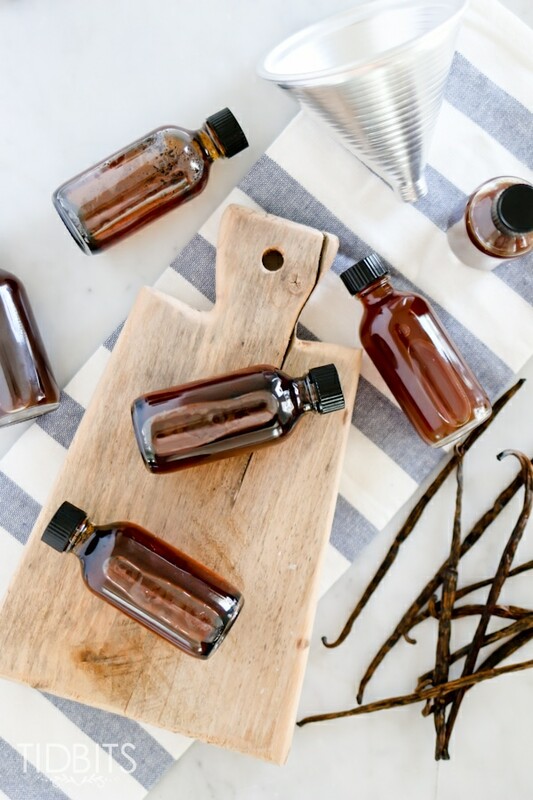 *This post constitutes an original TIDBITS method for making vanilla extract. We reserve the rights to all content, images, method, and directions found in this post, and they cannot be duplicated, re-posted, or distributed in any way or form. 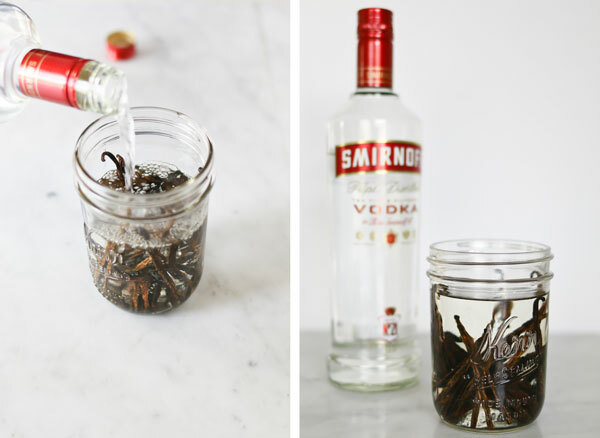 Last Christmas I had this totally original idea of making vanilla extract to hand out as gifts to my family and friends. A quick internet search told me that my idea was extremely unoriginal and that if I thought I was gonna hand out good quality vanilla by starting the process two weeks before Christmas, I was dreaming. I had a second idea pop into my head of making pressure cooker vanilla extract. A second search told me this was in fact an original idea, which I thought meant that it couldn’t be done, so I dismissed it. A few months later I noticed a small liquor store in my hometown. I decided to pay it a visit, with my kids no less, and see if the owner could give me some insight on my idea. I’ve since talked to my new friend from the liquor store many times as I tested pressure cooker vanilla extract with rum, bourbon, cheap vodka, expensive vodka, etc. He tries to talk to me about the great mysteries of the universe and I just smile and remind him that I’m not the genius my father was, I’m just trying to make a potent, less expensive bottle of vanilla extract! In the process of testing my idea, I had two experiences that told me I was on to something good. First, was the day I pulled out a batch of pressure cooker vanilla extract and my kids came running into the room asking if I was making a cake. Second, was the day I took a bottle of extract to the liquor store, and with a sniff and a lick, my friend offered to buy back his own liquor! 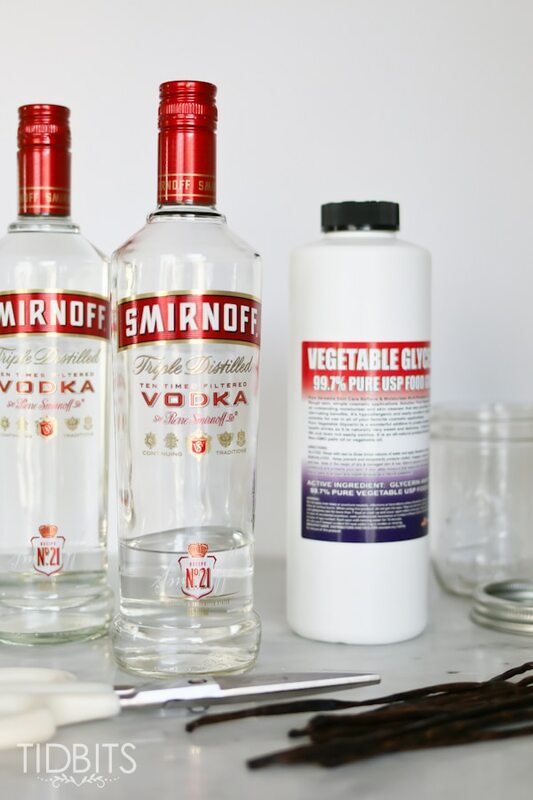 My cupboard is now filled with Mason jars of pressure cooker vanilla extract and I’ve narrowed down my favorite versions to one made with the red label Smirnoff Vodka 80 proof (40% alcohol) and an alcohol free version using food grade vegetable glycerin. In regards to the beans, I prefer a Grade B Madagascar vanilla bean which I’ve ordered here from Amazon, here from Vitacost and here from Beanilla. I was very pleased with the quality of beans from both companies and will order from them again and again (as soon as I get through my 6 pints of vanilla extract!). I now have more vanilla sitting in my cupboards than I will go through in a year, which means I’ve run out of excuses to drag my kids in for weekly visits to the liquor store to see our friend. However, my kids have grown to adore this amazing man and they insist on bringing him candy, muffins, and even birthday invitations. As for me, I’ve got a six month old jar of pressure cooker vanilla extract with bourbon that will surely make his day! 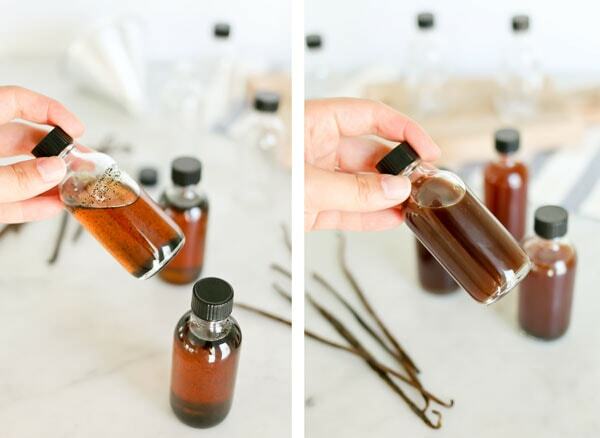 Before you make it to the printable recipe for pressure cooker vanilla extract, lets walk through the process. UPDATE 12/12/16 Due to some new methods popping up for making pressure cooker vanilla extract, I want to tell you why I settled on the method I did. I tested alcohol percentages of all my batches of vanilla to make sure they were staying above 35% (starting from 40%). It was only once I added the barely tightened lid, that I was able to consistently maintain this percentage. This means your vanilla is safe to store at room temperature long term and vanilla flavor will continue to be extracted from the beans if you leave them in the jar, win win! On my batches made in an open jar or directly in the pot, I not only lost a lot of volume, I also ended up with alcohol percentages as low as 25% which I was not comfortable with. 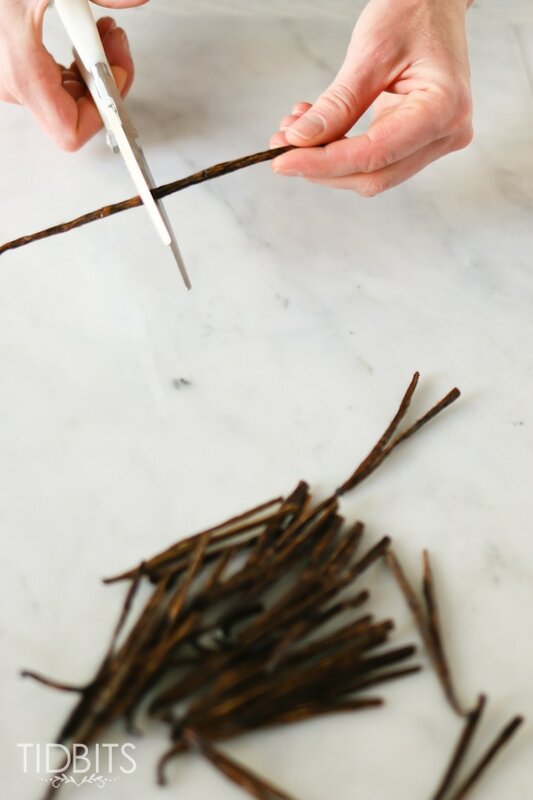 Last thing, if you’re vanilla smells strong of alcohol after you process it, let it sit for a week, swishing daily. The alcohol will mellow and the vanilla will be more present. Enjoy! Next, simply follow the instructions in the recipe below and you are well on your way to your very own bottle of homemade pressure cooker vanilla extract. And if you are looking for more recipe favorites from TIDBITS, check out our NEW COOKBOOK titled Master the Electric Pressure Cooker. Now go order your supplies and get started! 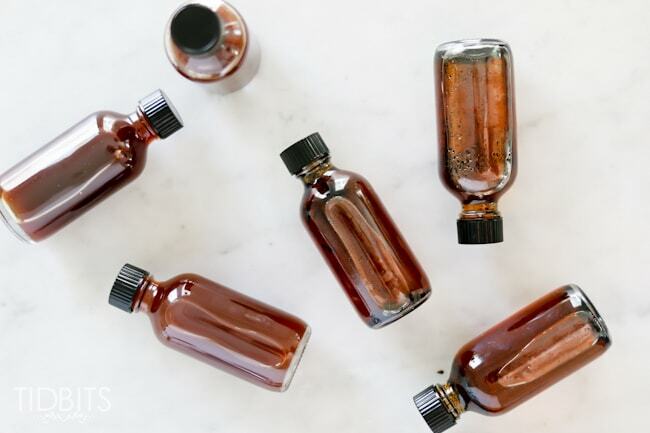 Whether you’re making it for yourself or for a quick gift, this homemade pressure cooker vanilla extract is sure to dazzle and impress! Enjoy! We’d love to hear what you think of this idea and if you give it a try! Is it normal to have a VERY strong alcohol odor just after the natural release finishes? It seems like maybe so from the comments, but I was surprised at just how strong it was. I did 2 pints with spiced rum, and one with bourbon. I’m going to swirl a few times a day and wait til the last moment to put them in jars, I hope it’ll still work for xmas presents! Valerie, Give it a couple weeks and it will mellow. If you need to give it away as gifts sooner than that, just put one of the used beans into each bottle so it can continue to infuse. But the alcohol smell is normal. A bottle of storebought pure vanilla extract smells quite strong of alcohol, I prefer the smell of my homemade much more than storebought! I bet the spiced rum will be amazing! All of my jars turned out great using the vodka! However, I made one jar using the glycerin, which I have never used and am unfamiliar with. The glycerin is so thick, like a syrup. Is this normal? Also, after pressure cooking it, hardly anything happened. Help! Maureen, yes, glycerin is thick. Is it for sure food grade glycerin? Give it a few days, swirl it a few times a day, and see if it changes. I’ve never had issues with my glycerin versions not changing, but I’ve had a couple people say that. You could cook it for another 30 minutes as well, that may do that trick. I just made 8 pint jars using your recipe! I can’t wait to give them as Christmas gifts auto friends and family. Here’s my problem though – I made one jar using the glycerin, which I have never used or am at all familiar with. The glycerin is so thick, like a syrup. Is this normal? Also, after pressure cooking it, hardly anything happened. Help! Will it work without the lid if I’m using the non-alcohol version? HM, I believe that will work great. You might get a little condensation dripping into your jar would be my only concern. Just so I understand completely. I make it in the canning jars first. Let it sit for a week or 2 in the jars. THEN I can transfer it to the pretty jars to five as gifts. Correct? Bonnie, Yes, that would be ideal. It’s amazing even the day it’s cooked, but after 2 weeks the alcohol smell diminishes quite a bit. 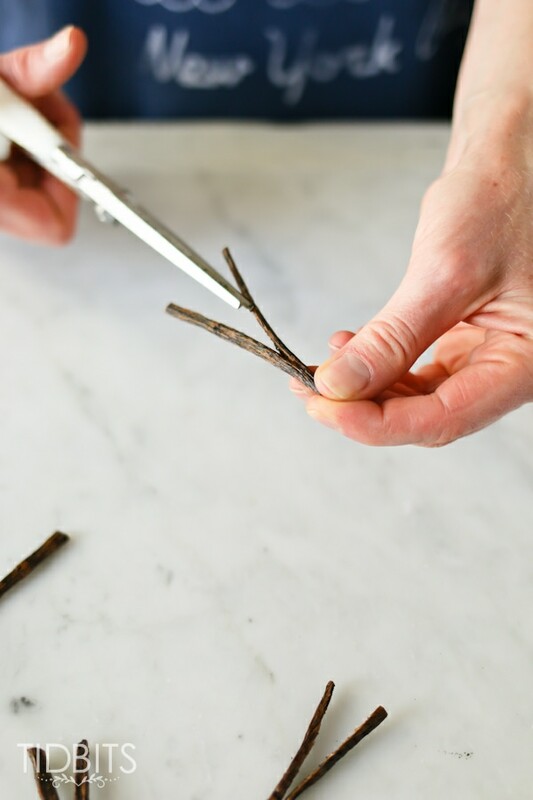 Add a half of a vanilla bean to all of your jars so the flavor will keep extracting even more. Well, I’ll try it today and let you know how it turned out. I just wanted to know if an airtight jar was safe to use with an instant pot. Thanks for your reply. 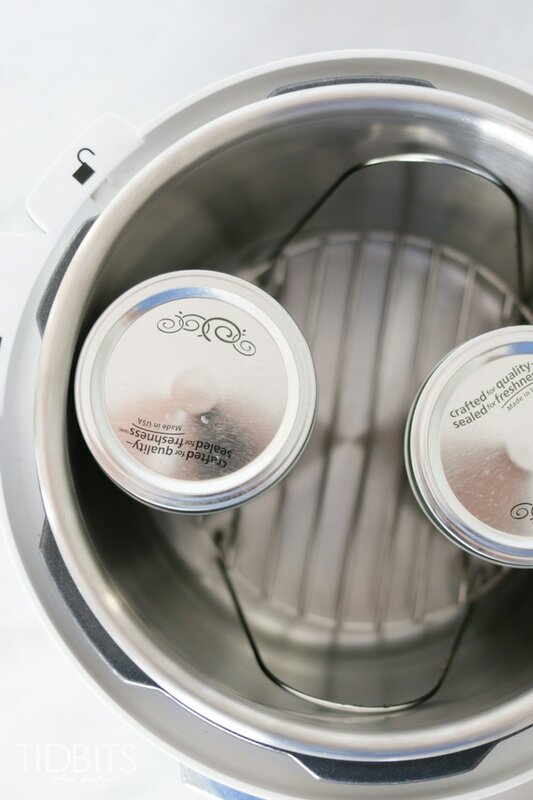 WECK jars are used for canning and they come with a silicone ring, a glass lid and 2 clamps which make them airtight. Can I use the weck jars the same way they are used for canning? Because you say to barely close the lid of the ball mason jar, I’m afraid the weck jars will be too airtight, or is that not a problem? Nour, Oh I see. So they are airtight jars that are approved for canning? I had a jar break when I was very first testing the extract and I assumed it was because I had the lid on tight. I did it a few times this way before I had a jar break, but I haven’t had one break since twisting it fingertip tight so that’s what I’ve advised others to do. I’m curious if the Weck jars are stronger than mason jars if they are approved for canning airtight like that. Interesting! I was recently gifted a good amount of alcohol and since I don’t drink, I opted to make my own extracts. 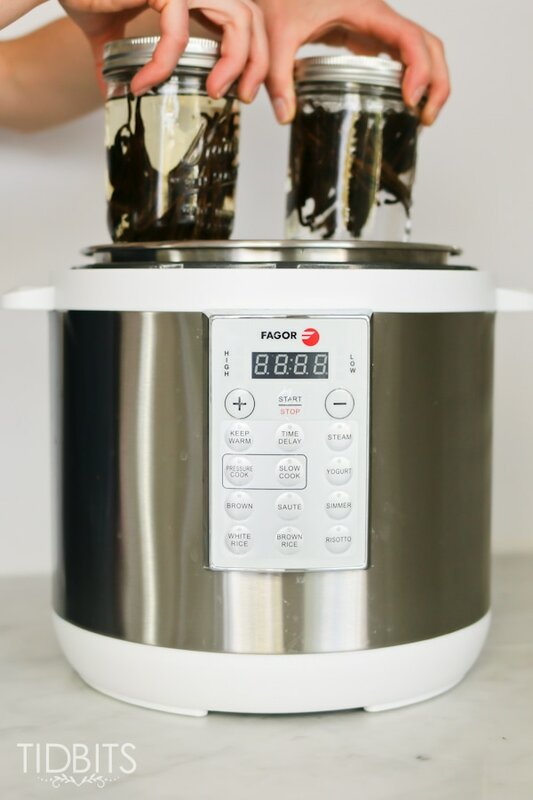 Have you ever made lemon, mint or almond extract with your Instant Pot? I would love to get your thoughts on how to do it! Afton, yep! I have an almond, mint, lemon, cinnamon, maple, and vanilla on my blog. They are all linked to in this post. This is just amazing! I just bought glycerin to make my own vanilla extract but dreaded having to wait for such a long period. I came across this recipe by searching for peppermint extract made from dried peppermint. I am so glad I did because this site is like finding a treasure! I do have one question though. 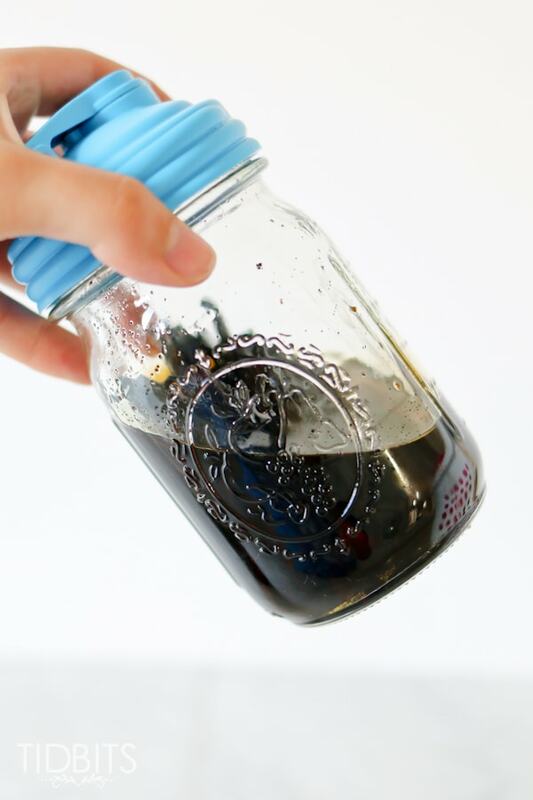 I live in Europe so I can’t get mason jars easily here, so I was wondering if I could make this recipe with WECK jars? Nour, I love my glycerin extracts! I’ve actually never heard of WECK jars, but as long as they are heat proof and able to handle pressure canning, you should be fine. Why do you need to use more beans in the pressure cooker recipe? Michele, Do you mean compared to non pressure cooker recipes? If that’s what you mean, the number of beans I used are similar to several different recipes I looked at to determine the typical ratio of beans to vodka. Let me know if that’s not what you were asking. Kathleen, I bet your friends were loving your gifts! As far as testing the alcohol percentage, I use a hydrometer, I Link to the exact one in the FAQ post I did about vanilla. 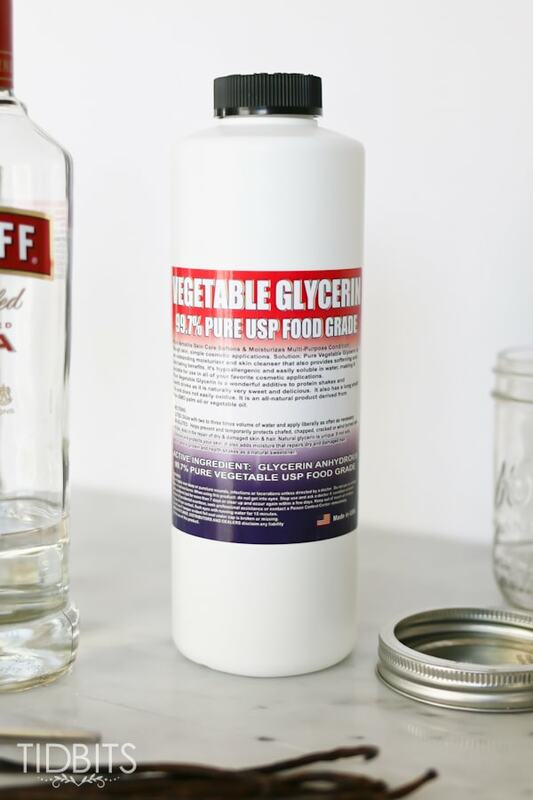 For the alcohol free version, I use the same amount of vanilla beans as the alcohol version and use a bit extra with the glycerin one when I’m cooking. I hope that helps! Oh dang, Charlie, that really stinks. Unfortunately mason jars can have hairline cracks that can cause them to break, just like with pressure canning. 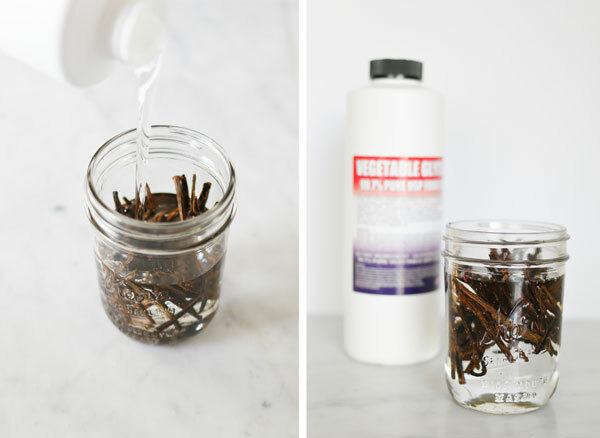 I’ve had 1 jar break a few years ago when doing vanilla and I was so upset. I have done it in a stainless steel bowl (which Beanilla said was fine to do) and it works, but my alcohol percentage went to 33% which I didn’t love, but that’s technically still high enough to store at room temperature. I tried it covered with a silicone lid and with foil and the foil kept a higher percentage. So definitely a possibility! Thanks for the response. Do you think increasing the proof of the alcohol would help with the percentage or I have a stainless container with a stainless lid, do you think that would work to keep the percentage higher? Above you said foil and silicone, did you put the foil on first and then put the silicone lid on top of that? Charlie, Yes, increasing the proof could help with that. If you have a lid, that might be even better, but I haven’t tested that. And I meant I tested a batch with foil and one with a silicone lid. The silicone lid one had less alcohol percentage when it was done. Try making with spiced rum!! Thanks for sharing! I cannot wait to try making some of my own. Quick question. When you transfer the vanilla to the decorative bottles do you discard all of the beans? Or do you stick some of the beans in those small bottles? Jeanne, Stick a bean (or half a bean whatever will fit) in each bottle. It will continue to get even stronger over time. When transferring to my gift-giving jar, do I take the old beans out and filter the seeds, then add a fresh bean? Or leave everything in there? Maureen, I wouldn’t filter it, those seeds have a lot of flavor in them. I would put one of the old beans back into the jars. They will continue to infuse more over time. Your giftees will love it! I was the blessed recipient of a bottle of pressure cooker vanilla last Sunday and can’t wait to start using it! The label was made using the new Cricut Maker and is simple and elegant with “VANILLA” written in all caps. I know everyone looks for catchy phrases but I like the way this looks. Please keep your recipes coming; you are an inspiration! Helen, I love hearing that! And thank you so much! Hi! I’m looking to start making some extract but want to make sure I am understanding the ratio of everything. For each pint size mason jar that I use, how many “sticks” lol of vanilla am I adding and how much vodka? Thank you so much for any guidance you can give me! Erin, For a pint jar I add 7 or 8 depending on how big they are. Then you add vodka until it reaches about an inch and a half from the top. Does that help? 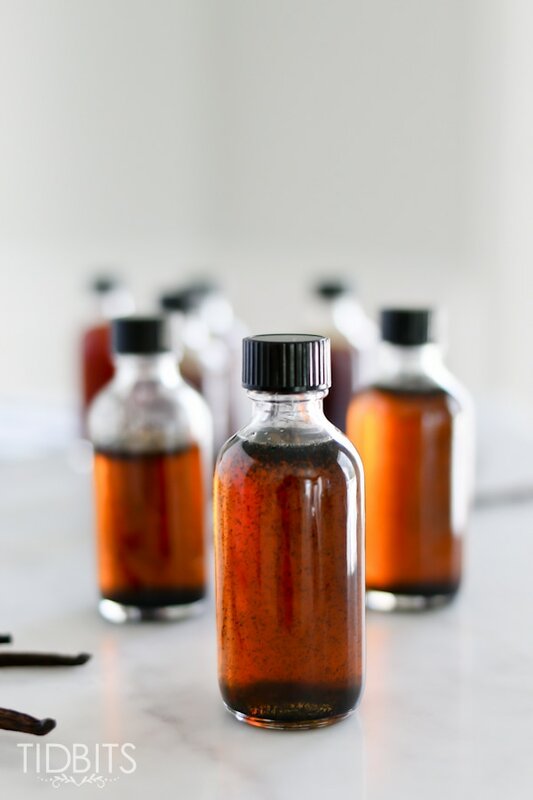 Check out the updated vanilla extract post that I did this year. I think that will help a ton with your questions! How many beans go into each pint mason jar? If I make this in the pressure cooker as you described and then want to put it in smaller bottles for gifts, should I sterilize everything? Kathy, I wouldn’t worry about sterilizing per se, just make sure the bottles you’re transferring to are really clean and the alcohol should take care of the rest, as far as keeping it shelf stable. I am wondering if you have every used your beans more than once? I have some beans that I used in the traditional method. Do you think they will work in a second batch in the pressure cooker or is it a one time use? Sarah, I’ve never done it myself, but Rich Lum (do you know him?) says he’ll reuse them in combination with a couple of fresh ones. What an amazing idea – definitely trying this! Quick question – when you ‘barely’ put the lid on, are you screwing until it just starts to tighten or less than that, just so it won’t come off? Beccy, I twist it just until I meet resistance. So it’s tight enough to stay on if you picked it up by the lid, but liquid would still spill out if you tipped it upside down. Does that help?